Wine Recommendations For August 2009. Wine For The Dog Days Of Summer! The Dog Days of Summer, the Canicula; call it what you will, we need to feel refreshed. Wine recommendations for August 2009 will do the trick. At this time of the year we crave a wine that is light and refreshing. Summer evenings are made better with a nice, cool riesling or sauvignon blanc. And even if you prefer red wines, a pinot noir sound better than a cabernet sauvignon at this time of the year. Well, we've got wine suggestions that will make those dog days bearable, even enjoyable, and at great prices too.! There are so many great values out there that I can't limit the suggestions to 5. So, in honor of the Dog, I'll expand the list of types of white wine. Enjoy! St. Hallett Riesling Eden Valley 2008. Tangy notes of quince and citrus. Light and refreshing. A fantastic value. Score of 91, $17.00 USD. Australia. Kuentz-Bas Riesling Alsace Tradition 2007. With floral notes and hints of apples, peach, and citrus. Score of 89, $17.00 USD. France. Madrigal Sauvignon Blanc Napa Valley 2008. So many layers! check out the hints of apples, melon, citrus, grass, and even a bit of floral notes. Another fantastic value. Score of 92, $15.00 USD. California. Mount Nelson Sauvignon Blanc Marlborough 2008. Delightful, here you will find notes of lemon, pear, grapefruit, all wrapped up in mineral accents. Score of 91, $17.00 USD. New Zealand. Penfolds Riesling Adelaide Thomas Hyland 2008. Pears, Apples, Citrus, Orange Blossoms. This one has Summer written all over it. Score of 90, $15.00 USD. Australia. Mason Sauvignon Blanc Napa Valley 2007. Light and grassy. Taste the citrus and herbs! Score of 90, $16.00 USD. California. Beringer Alluvium Blanc Knights Valley 2007. A blend of Sauvignon Blanc, Chardonnay, Viognier, and Sémillon. A bit smoky and spicy, but with plenty of acidity in the citrus and peachy notes. Score of 89, $16.00 USD. California. Joseph Mellot Pouilly-Fumé Le Troncsec 2008. Creamy melons, minerals, and grass. Score of 89, $20.00 USD. France. Cupcake Sauvignon Blanc Marlborough 2008. Flavors of nectarines and herbs are complimented by notes of citrus fruit. Light and bright. Score of 90, $15.00 USD. New Zealand. Beckmen Sauvignon Blanc Santa Ynez Valley 2008. When you think of summer, what comes to mind? Apricots, melons, lime, freshly cut grass! Well, this is the wine for you. Score of 91, $16.00 USD. California. We haven't forgotten the red wine lovers! Ave Malbec Mendoza Premium 2007 Plums and violets, balanced by a refreshing acidity. Score of 90, $16.00 USD. Argentina. Angove's Grenache-Shiraz South Australia Nine Vines Rosé. Think berries, think watermelon, think summer. Score of 88, $13.00 USD. Australia. Rocky Gully Shiraz-Viognier Frankland River 2007. Apricots, berries, currant. Bright and a bit spicy. Score of 90, $17.00 USD. Australia. Redtree Pinot Noir California 2008. Easy on the palate; taste the cherries, rhubarb, and spices. Score of 88, $8.00. California. Alice White Shiraz South Eastern Australia 2008. Fresh notes of orange and blackberry. Score of 88, $9.00 USD. Australia. 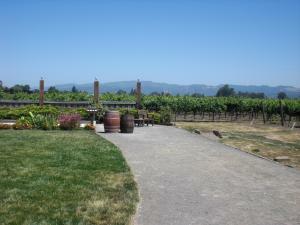 Refresh Your Summer Days With Wine Recommendations For August 2009!